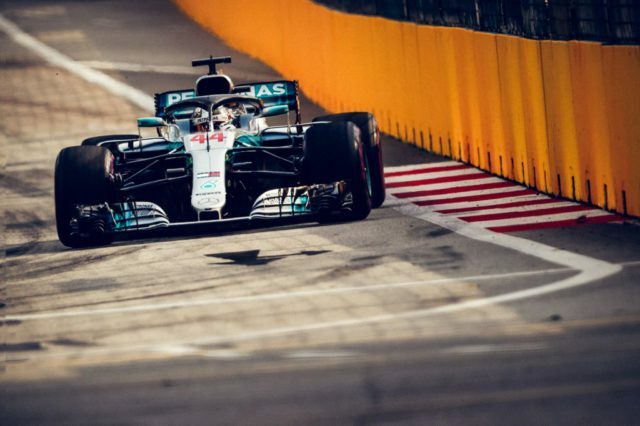 Lewis Hamilton took pole position at the Singapore Grand Prix with a stunning lap ahead of Max Verstappen’s Red Bull. Sebastian Vettel will line up directly behind his championship rival in third, after being unable to match the Mercedes driver’s pace. Conditions were clear and warm as the opening salvos of qualifying got underway around the Marina Bay circuit. Kimi Raikkonen immediately set the early benchmark, posting a 1’38.534 on the Hyper Soft tyres. Lewis Hamilton was the first driver to opt for a run on the Ultra Soft compound, but was over a second off the pace of the Ferrari. Despite concerns over the performance of the Ultra Soft tyres, Mercedes opted not to switch to the Hyper Softs. It was a gamble that only just paid off, with Hamilton only just avoiding elimination in 14th place. Magnussen was the surprise casualty of the session eliminated from qualifying in 16th place in Haas. Brendon Hartley was also out in 17th in his Toro Rosso, ahead of Stoffel Vandoorne in the McLaren who clashed with the outside wall on the exit of turn 21 on his way to 18th place. Williams were to the back row of the grid, with Sergey Sirotkin and Lance Stroll in 19th and 20th place, respectively. While Mercedes abandoned the Ultra Softs, Ferrari decided to send Kimi Raikkonen out on the Ultra Softs for his first run in Q2, but quickly aborted the lap after Raikkonen was unhappy with his tyre’s performance. Raikkonen switched to the Hyper Softs and used the extra grip to good effect, lowering the fastest time of the weekend to a 1’37.1, which would prove the quickest of the session. Sebastian Vettel’s final attempt was heavily compromised by traffic in the final sector. Мeaning the Ferrari driver was over six tenths slower than his team mate. Charles Leclerc flirted with the wall on the outside of turn 21, but reported no damage to his Sauber. As the session concluded, Fernando Alonso only just missed on on advancing to the top ten shootout taking 11th place in his McLaren ahead of the man taking his seat next season, Carlos Sainz in teh Renault. The two Saubers of Charles Leclerc and Marcus Ericsson were the next to be eliminated. Pierre Gasly was the final driver out in Q2. The battle for pole position looked set to be a shootout between the two Ferrari drivers and Hamilton’s Mercedes. After the first laps, it was Lewis Hamilton who took provisional pole position with a stunning laptime of 1’36.105. It was by far the fastest lap of the weekend so far. Max Verstappen was closest to the Mercedes, albeit three tenths adrift, with Vettel six tenths off his championship rival. With drivers out to prepare for their final qualifying attempts, Mercedes were especially careful on their tyres on their outlaps. Hamilton’s attempt to improve on his provisional pole time came undone at turn seven, running wide and onto the kerb and abandoning his lap. Vettel went fastest of all in the first sector, but was unable to keep that momentum for the remainder of the lap. And he could not better third place on the grid. Verstappen was the final driver with an opportunity to usurp Hamilton. But the Red Bull could not find a way to improve, handing pole position to Hamilton. Valtteri Bottas lines up fourth on the grid, ahead of Kimi Raikkonen’s Ferrari. Daniel Ricciardo will start sixth, a second faster than Sergio Perez’s Force India. Romain Grosjean, Esteban Ocon and Nico Hulkenberg rounded out the top ten on the grid.